Background: Over the past century, the prevalence of skin diseases has substantially increased. These diseases present a significant physical, emotional and socio-economic burden to the society. Such conditions are also associated with a multitude of psychological traumas to the suffering patients. The effective treatment strategy implicates targeting of drugs to the skin. The field of drug targeting has been revolutionized with the advent of nanotechnology. The emergence of stimulus-responsive nanoplatforms has provided remarkable control over fundamental polymer properties for external triggers. This enhanced control has empowered pioneering approaches in the treatment of chronic inflammatory skin diseases. 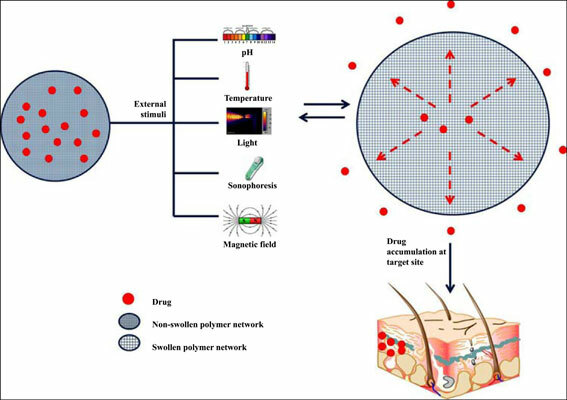 Objective: Our aim was to investigate the studies on smart nanoplatforms that exploit the altered skin physiology under diseased conditions and provide site-specific controlled drug delivery. Method: All literature search regarding the advances in stimulus sensitive smart nanoplatforms for skin diseases was done using Google Scholar and Pubmed. Conclusion: Various stimuli explored lately for such nano platforms are pH, temperature, light and magnet. Although, the scientists have actively taken up this research topic but there are still certain lacunaes associated which have been discussed in this review. Further, an interdisciplinary collaboration between the healthcare providers and pharmacists is a pivotal requirement for such systems to be available for patients. LCST, magnetic field, photosensitive, pH responsive, polymers, stimuli sensitive, temperature responsive.